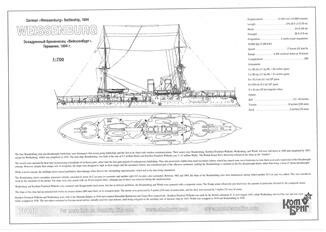 SMS Weibenburg was one of the first ocean-going battleships of the German Imperial Navy. She was the third pre-dreadnought of the Brandenburg class, along with her sister ships Brandenburg, Wörth, and Kurfürst Friedrich Wilhelm. 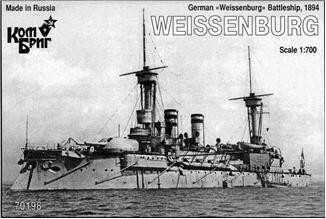 She was laid down in 1890 in the AG Vulcan dockyard in Stettin, launched in 1891, and completed in 1894. The Brandenburg class battleships were unique for their era in that they carried six large-caliber guns in three twin turrets, as opposed to four guns in two turrets, as was the standard in other navies. The British Royal Navy derisively referred to the ships as "whalers".